Video I made about the #SaveTheExpanse campaign. On May 10 it was announced that the hit sci-fi series would not be renewed after the third season. Main reason being that SYFY, who owns the live broadcasting rights and finances the series wasn't seeing enough money flowing back from advertisements. This is because most of the viewers watch the show either via Amazon or Netflix who own the streaming rights domestically and internationally respectively. So even if 1 billion people watched The Expanse, it would make no difference for SYFY since they only receive earnings from the broadcasting rights. With SYFY being potentially no longer involved Alcon Entertainment, who owns the rights to the franchise, had to look for a new production company and broadcasting partner. Netflix and Amazon were first choice because they already invested in the series, but also because both companies are investing heavily in original content and sci-fi in particular. Although cancellations of popular TV-shows are quite common, this cancellation sparked an uproar from the fanbase that quickly turned into a global movement endorsed by celebrities like Game of Thrones’ George R. Martin and Star Trek’s Wil Wheaton. Under the slogan #SaveTheExpanse fans from around the globe started putting out initiatives in an attempt to save the show. As a big fan I couldn't sit idly by and decided to start the official petition to save The Expanse from television purgatory. To save the futuristic series, I used an ancient technique. A petition, giving fans worldwide an easy way to express their feelings. The most powerful component of grassroots movements is the power of the crowd. 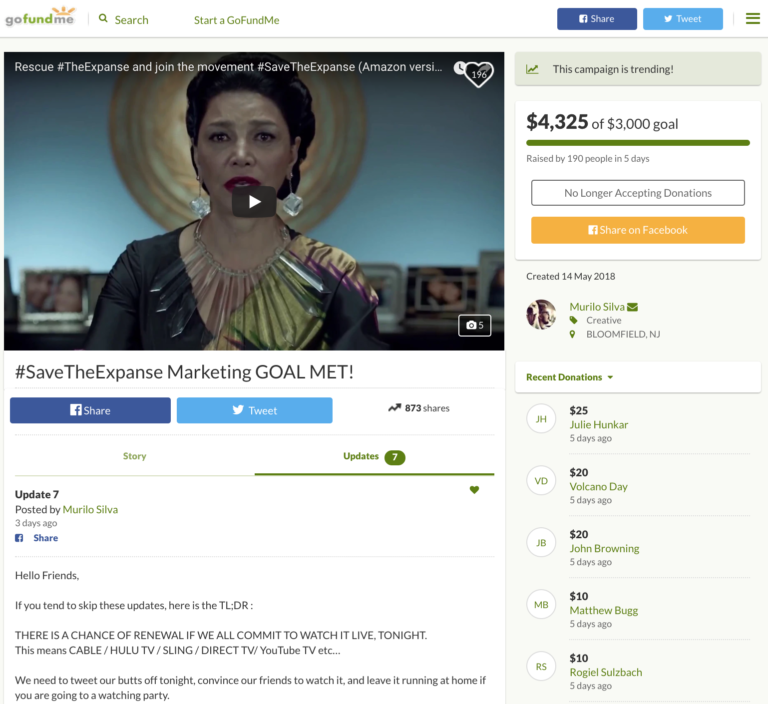 Because at the same time I was doing my petition, other fans started setting up their initiatives up as well with the most noteworthy being a GoFundMe-crowdfunding campaign that sought to fly an airplane over the Amazon offices in Santa Monica with a #SaveTheExpanse-banner. The crowdfunding quickly caught on and smashed its goal in no time suddenly making the campaign a lot more tangible. Soon after, the airplane went up in the air and flew the banner over the Amazon offices catching the attention of everyone below… and the rest of the world. It was at this point that we and the other initiators like the people behind the crowdfunding campaign and the viral trailer reached out to each other to form an organized strike team that could channel all the energy and the ideas from the fans, but also serve as a point of contact for the cast and crew. And thus the #SaveTheExpanse Campaign was born. The exceptional support from the cast and crew has also been a major factor contributing to the success of the campaign. From every actor to the writers of the series and even authors of the books; them backing our campaign from day one definitely provided a boon to everyone involved. We did it cowboys! And we're being noticed. Amazon: our lord and savior? The campaign reached a fever pitch when The Hollywood Reporter dropped the news that Amazon was in the talks to acquire the rights to the show. Nor Alcon nor Amazon would confirm it, but every fan had this feeling salvation would be upon us soon. When I learned that Amazon's Jeff Bezos would be attending the International Space Development Conference (ISDC) in Los Angeles and that The Expanse cast would be there as well, I immediately booked my plane and left off to LA! While I was up in the air, the weather balloon we crowdfunded for our latest stunt managed to get our miniature Rocinante-ship into the atmosphere. Cool fact: this crowdfunding had a higher goal than the previous one, but smashed that goal in less than three hours no less. After a rather uneventful nine hour flight, we landed in LA at about 5PM local time. Upon arriving I immediately reached out to Ed (trailer guy) and Murilo (crowdfunding guy) from the #SaveTheExpanse Campaign Team to finally meet them face to face and decompress a bit. After these hectic two weeks we really needed a beer. Yam seng! The prospect of meeting the cast, crew and Jeff Bezos also prompted us to think about our next and final stunt for when we would get to meet them on Friday. This was our moment and regardless of what would happen we wanted to make sure they would remember why we had come here. We ultimately decided to go for a simple banner with the simple message: "Hey Jeff, #SAVETHEEXPANSE <3"
Finally meeting the cast and crew was surreal. Not only because it's strange to meet people you had been watching and admiring for years, but also because they made us feel like we genuinely were part of The Expanse. From our perspective, #SaveTheExpanse is the first fan movement where the relationship between cast, crew and the community has been so personal and reciprocal which is the main reason why this campaign has been so successful. Interaction between actors and their fandom isn't exactly a phenomenon and has actually become common practice thanks to platforms like Twitter and Instagram, but The Expanse community took it to another level by establishing a direct line of communication between the fans and the cast and crew that worked both ways. This made it so much easier for the campaign team to relay questions to the cast and crew, but also to communicate updates and tips for the campaign back to the community. Proof that good community management and taking up a leadership role go a long way. When we decided to fly to Los Angeles there still was no official confirmation from either Amazon or Alcon. Nevertheless, everyone involved ranging from the fans to the cast and crew had a feeling this crazy journey would be coming to an end soon. And even if the deal wouldn't get announced at ISDC, it would only be a matter of days before it would. While the confirmation didn't really come as a surprise to anyone every fan around the world was genuinely relieved and emotional when Jeff Bezos uttered those words. DID THE FANS REALLY #SAVETHEEXPANSE? But imagine if the fans never had started this campaign and had just let the news about the cancelation pass without much noise. Jeff Bezos probably would have had second thoughts about saving the show or at least about the deal. No, thanks to #SaveTheExpanse campaign the show got bombarded into the mainstream and reached millions of people many of which who had never heard of the show before. While Amazon and Netflix never share their streaming numbers, the Nielsen ratings clearly showed a large uptick in live ratings during the campaign meaning that #SaveTheExpanse got a lot of new people into watching the show on SYFY. Furthemore, our own social media numbers don't lie either. On Twitter for example we reached over 2 million people with zero ads. On Facebook we reached over a half a million people which is impressive considering it's a bit more difficult for new pages to go viral there than it is on Twitter. With an advertising budget of less than 700 euros we reached over half a million people and became one of the biggest The Expanse fan pages on Facebook overnight. The media coverage of the campaign wasn't too shabby either. We got picked up by almost every relevant American and Belgian news outlet. We received the coverage from the Belgian press because I proactively reached out to them.